Nigerian Senate president, Bukola Saraki and the Speaker, House of Representatives, Mr Yakubu Dogara have recently visit president Muhammadu Buhari in London. President Buhari welcomed the Senate president and the speaker of representatives, Bukola Saraki and Yakubu Dogara respectively on Thursday at the Abuja House, London after five days of launching his media team. 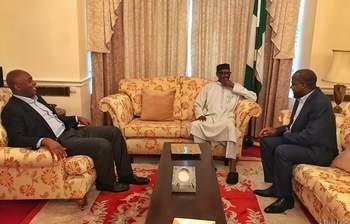 The trio, Buhari, Saraki and Yakubu’s source of meeting is not known as they all held a close meeting and no staff or official of the presidency didn’t disclose anything. But, the visitation comes after 100 days president Muhammadu Buhari left Nigeria to United Kingdom for medication. President Muhammadu Buhari’s absence from the Nigeria, his country has created a lot of bad reactions, which includes some numbers of protests by some citizens under the auspices of “Resume or Resign” group.